Congratulations to our 2017 Graduate Fellows! These fellowships are available thanks to the generosity of Scott and Betty Lukins, Alice O. Rice, and the Burlington Northern Santa Fe Railway Foundation. 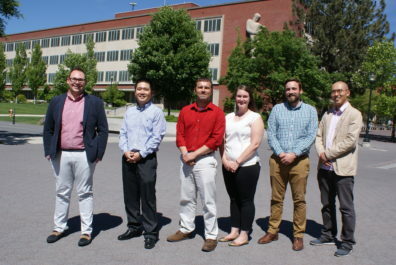 Pictured left to right: Miles Sari (Communication), Taewoo Kang (Political Science), Matthias Baudinet (History), Kimberly Lackey (School of Biological Sciences), Daniel Mueller (Political Science), and Youngki Woo (Criminal Justice). Graduate Fellows not pictured are Matt Newsom (Anthropology) and Rebecca Evans (School of Biological Sciences), who are currently conducting fieldwork. Matthias Baudinet (History) examines issues and policies on identity, ethnicity, and nationality in the French-German border region of Alsace-Lorraine, and specifically the ethnic cleansing authorized by the French government that took place in the region directly after the end of the First World War, when Germany was forced to hand over Alsace-Lorraine to France. Rebecca Evans (School of Biological Sciences) is using her award to work with park superintendents, rangers, and interpretive staff on education and policy initiatives. Her plan is to provide accessible information to the public and National Park Service (NPS) staff on the detrimental effects of climate change and air quality through resource briefs, seminars, and educational and website material, while also developing the next steps for research and management to protect NPS units. Taewoo Kang (Political Science) explores how the changing communication environment influences campaign strategy and the public’s perception of candidates running for political office, and whether people see a candidate differently depending on where they get campaign messages, as well as what happens if a voter receives inconsistent messages from a campaign through multiple communication channels. Kimberly Lackey (School of Biological Sciences) focuses on methods to collect and preserve human milk samples collected in rural field conditions, as well as the subsequent analysis of these samples for both their overall microbial community structure and Mycobacterium leprae, the causative agent of leprosy. Her doctoral work will culminate in a proof-of-concept project designed to determine if M. leprae is present in the milk of women with leprosy. Daniel Mueller (Political Science) works on clarifying the mechanisms that lead to sustainability in the context of aviation biofuels. He hopes his research will inform our understanding of which community traits lead to sustainable outcomes, ultimately providing decision makers with a tool to determine which communities are best suited to site an aviation biofuel supply chain that will be environmentally, economically, and socially sustainable. Matthew Newsom (Anthropology) focuses on the violent cultural memories associated with WWII and bifurcation with which Germans continue to struggle as they arise in a variety of public and political issues ranging from international conflict to publicly-funded Holocaust memorials. He is using his award to travel to Berlin and use anthropological field methods to investigate the engagement of social scientists in public and political debates regarding city, state, and federal-level policies designed to address this crisis. Miles Sari (Communication) examines how recent protests against speeches from conservative figures like Milo Yiannopolous, Charles Murray, and Ann Coulter raise questions about the state of democratic dialogue between conservative and liberal college students. His qualitative study investigates how conservative college students express their policy positions when they think they are in the minority, as well as the implications of perceived suppression of speech. Youngki Woo (Criminal Justice) is utilizing his award to attend the Summer Program in Quantitative Methods of Social Research workshop, held at the University of Michigan. This will enable him to expand the breadth and impact of his research on the effects of cannabis and other intoxicants on fatal crashes in Washington State.